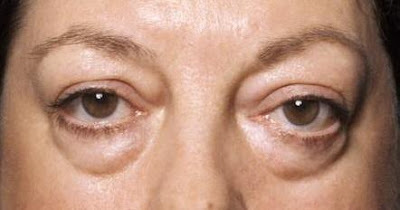 Eye bags are caused by fluids which are being trapped in the tissues located under the eyes. Eyes’ puffiest moments are upon waking up. This happens because the fluids, while you were sleeping, have settled in the eye area. Experts say that this usually happens especially to people who have taken too much amount of water or liquid or have eaten salty foods before going to bed. The swelling around the eyes usually diminishes after a few hours when the fluids have been re-absorbed by the body. Aging is another factor for having eye bags. While we age, our skin also ages. Through the years, the skin located around the eyes becomes thinner and thinner. The skin also loses its elasticity therefore causing the underlying fat around the eyes bulges out resulting to what we call eye bags. Most women may also suffer from eye bags especially during their menstrual visits. This is because of the monthly hormonal changes in the body. There are people who still wake up having puffy eyes even though they have had enough hours sleeping overnight. Please consider the fact that it might also be due to allergic reactions. Say for example, you might have eaten something you are allergic from or perhaps, your pillows are not suitable for your skin type. If the swelling around the eyes is similar to round pouches rather than just simple puffiness, consult your physician immediately as it might be a sign of underlying disease, usually connected to a thyroid condition commonly known as Grave’s disease. It can also be related to kidney issues. Splash cold water on your face as cold water helps in fluid circulation. Also try giving your eyes a gentle circular tapping to loosen the fluids present under your eyes. The trapped fluids around your eyes will then be re-circulated to the rest of your body, minimizing the size of your bags. This next technique has been mostly practiced by people suffering from morning eye puffiness. They put a spoon inside the fridge for some minutes. The cold spoon will then be used to cover the eyes to lessen eye bags. 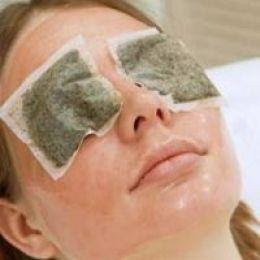 You can also use two tea bags by placing them on your closed eyes for about 15 to 20 minutes. Teas are good for the skin as it helps in tightening the pores and reducing eye bags as well. Drinking ibuprofen during your menstrual period as it is proven to help in reducing fluid retention. If you suspect that your puffy eyes are due to allergic reactions to food and your pillow, you can always take antihistamine pills to ease the condition. Lack of proper rest is one of the most common causes for bags under the eyes. Along with good hydration, give your body the rest you need, try to sleep more. If what you need is rest, no matter how remedies try to remove those bags, the results will not be as visible. nice to see the tips and that was great.